Hi, I’ve read that since the UK paper counterpart has been scrapped that a code needs to be supplied to the hire company to check the validity of the driving licence…..is this the case please ? I can’t say whether or not it would be cheaper but you can get to those places by public transport. Check timetables first to plan your time as efficiently as possible. Hello Julie, may be you know. If my driving licence is only 6 months, can I rent a car in Portugal? I’m not sure if you mean it’s only valid for 6 months or you have only had it for 6 months. Either way, it’s best to check with the rental agencies for specific questions like this. 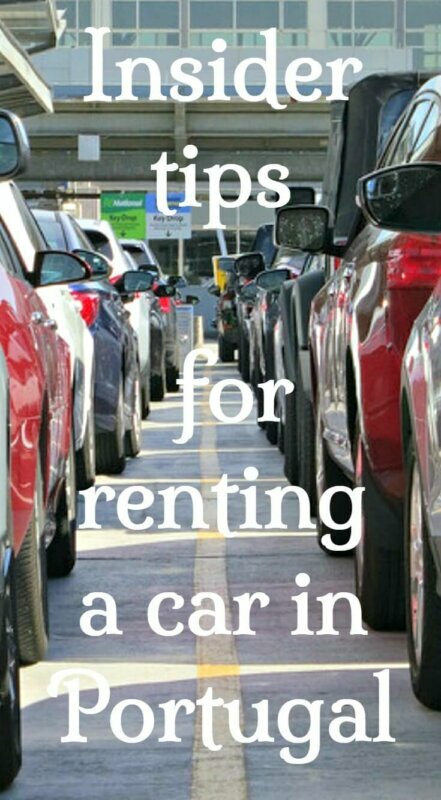 Your article is titled “How to rent a car in Portual and Avoid Sneaky Extra Charges”..however reading all the advice and reader’s experience as well as my own experience..YOU HAVE TWO CHOICES PAY AN EXTRA $1,000 OR HAVE A HOLD OF $2,500 PLACED ON YOUR CREDIT CARD. There is absolutely no way of avoiding these sneaky charges!! Rental companies should have to be more forthright about these hidden insurance charges. It’s time that these hidden clauses are brought to light and force these companies to justify why foreign insurance coverage isn’t good enough, or why is it that the additional coverage is $1,000, when everywhere else it’s about $19/day for insurance? Also best advice is to take your cell phones out and video the vehicle inside and out bumper to bumper, both at picking up and dropping off. Also prior to leaving, have your own waiver to be signed by car rental place to ensure your deposit is released within 24 hours not 30 days. This article brings light to the situation however, there is no whay of avoiding these charges! John, I think it very much depends on the rental company as to how much they hold on your credit card and you really need to check that when you make the booking so you can arrange an increased limit with your card provider if necessary. If you have independent insurance that covers the excess, the rental company will still place a hold on your card but will release that when the car is returned undamaged. I have no idea where your $1,000 came from but I’ve stopped using the cheaper companies as they are often the worst when it comes to trying to make money in other, more underhand ways like this ridiculously high hold. Last rental I did in Portugal, the hold on the card was less than €1,000 so it varies. If you turn up at the rental office without sufficient limit on your credit card, then you’re at the mercy of the company, as we found to our cost in the UK once. Great blog. I read your blog and i get the some valuable information about rent car in Portugal. Very helpful information. Thanks for sharing the great information. Good Luck! I do not recommend anyone to use DSCAR: from my experience they provide lack of information while you are signing contract and charge you extra afterwards as they have 100 euro deposit of your money. Eventually I had to pay for the transfer of money back to my account as well, what was not mentioned by company`s employer. All and all, they did not answer my emails for weeks when I asked for clarification of a charge they had taken from those 100 euro. Not a good experience at all. 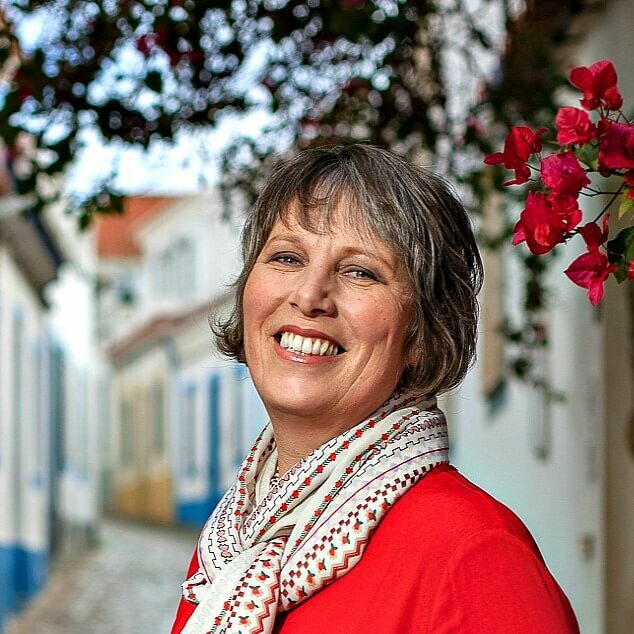 We will be in Portugal Sept 11 – 23 this year and I have really been enjoying your website and blog posts. We will be flying into the airport and traveling directly to Sintra to spend a few days. Our accommodations there have free parking, as well as paid airport pick up available. I have yet to book a car (this will be a driving trip) and am unsure if we should just plan to pick up our car on arrival, pay for a few extra days and let it sit in Sintra while we explore, or if we would be better to take either public transport or airport shuttle to Sintra, then figure out a way to go back to airport to pick up our car or reserve one at a town closer to Sintra. Either way, our final drop off will be back at the airport. (I’m figuring the extra few days of rental charges for the first scenario would be about the same as having different pick up and drop of locations in the second scenario.) Should we be unduly concerned about traffic leaving the airport between 11 – noon on a weekday morning? What would you advise? Hi Julie, Do you have any opinion or know anything about Payless car rental in Faro? Hi Daniel, I’m afraid I haven’t even heard of them so can’t help. Thanks for sharing the article.You solved all my problems. I was scared to rent a car because I heard so many things . I am glad that I read your article . Thanks . I’d prefer to buy a standalone policy as you suggest but this makes it seem like you HAVE to buy increased coverage through them. Do you know if this is correct? 1) Should we drive WHILE in Sintra–as we hear parking can be a huge challenge for these places we plan on visiting(we will visit: Day 1: Just tour around Cascais on day of arrival for walking around and meals. Day 2: Quinta da Regaleira Palace, Palacio Nacional de Sintra, Santurio da Peninha, & Cabo da Roca. Day 3)Pena Palace, Castle of the Moors, & Convento do Capuchos (the palaces of visit can be modify to best suit the best getting-around method). 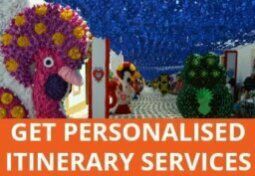 a) How should we get around with those attractions in mind–taxi, bus, etc.? 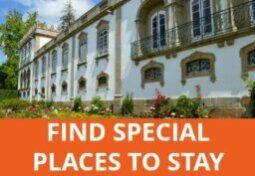 b) Where should we rent a car for the remaining tours of Portugal (as we hear there’s no car rentals in Sintra. We plan to end our Portugal trip with 3 days in Lisbon before flying back home)? What should we do Julie? Thanks so much for taking the time to read and answer our questions in advance! We really would appreciate giving us insights in this stressful part of the planning! 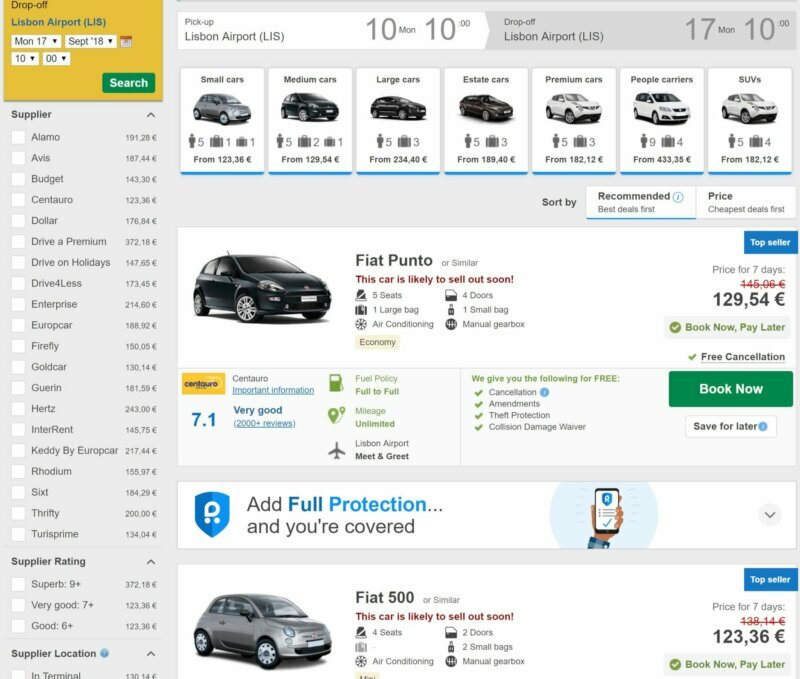 Hi Julie, I read your site with great interest, obtained Excess Insurance cover from MultiTrip, and used a price comparison site to list Portugal Airport cars. I booked a March 2018 seven day trip, selecting a small car (VW UP), with InterRent, and have been quoted only 7.05 euros for the week! This quote lists Full to Full petrol, CDW, Unlimited Mileage, Roadside Assistance, Theft waiver, Third Party insurance and VAT included (all in writing) .. is this a mistake, or am I heading for massive hidden costs somewhere when I pick up the car? How can it be so cheap? I can see why you’re wondering if it’s too good to be true, Jim. Unfortunately, I can’t answer that. It all seems to be in order and if you can’t find anything suspicious in the T&C, it should be fine. If CDW is included, you don’t even need that separate policy, although I’d double-check that. March is off season so that might be why it’s such a good deal. Wondering how that car rental deal worked out for you? Were there any hidden costs? thanks… planning ahead for Sept 2018. Probably but you should check the conditions on your credit card, because it depends on those and not the rental car companies. Most credit cards, especially travel related ones cover CDW. Is this adequate in Portugal? I would think so but expect to have the excess ‘held’ on your credit card until the car is returned safe and sound -see previous comments. This is one reason I always rent directly with the rental agency. I never use any intermediaries. So far I haven’t had a problem like this. This is probably not a timely comment but I think it’s important to point out anyway: most cheap car hire contracts do not allow border crossing. Your insurance becomes void as soon as you cross the border. Make sure to read the fine print about this, if you’re planning to rent a car to travel through more than one country. Good to know. Thanks for the tip, Paulo. 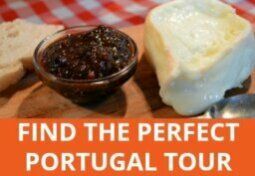 Hi Julie – We are planning a 3 month family trip to Portugal for May-July 2018. Flying in and out of Lisbon (from US). Do you have any advice or information regarding long-term car rental, or short-term lease? I have just discovered your very informative site, so I’m sure your readers will see me asking questions on other topics too! Thank you for this great resource! Hi James, other than what I’ve covered in this article, I have nothing more to add on the subject of car rentals, I’m afraid. I’ve only ever needed short term rentals but I know that it’s possible to arrange longer ones.